This look was inspired by Lauren of Fizz and Frosting. 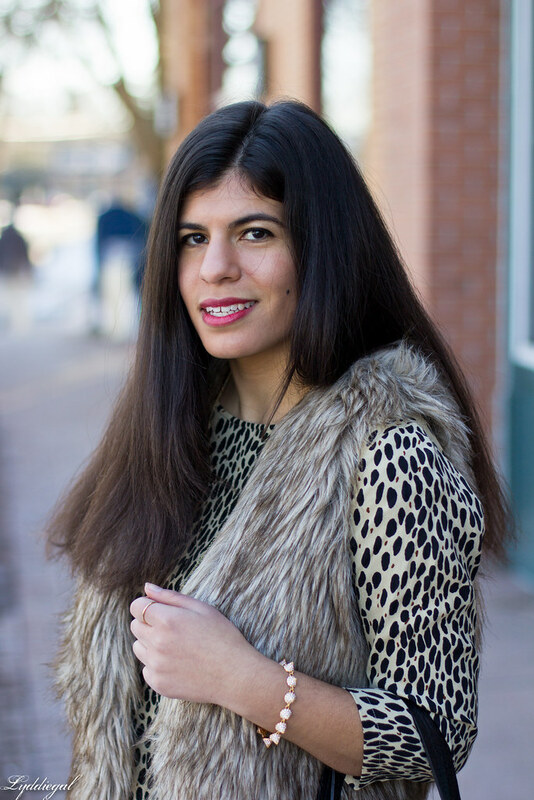 Ever since I saw her pairing her nearly-identical-but-in-dress-form leopard print with a fur vest I'd been itching to duplicate it, and when it was warm enough for three-quarter sleeves and no coat, I finally did. In a world where every other outfit is likely inspired by someone else, I don't usually feel the need to give credit. If I see someone wearing jeans and a striped shirt and then a few days later I pull on jeans and a striped shirt, I'm not going to give them props. They did not invent jeans and a striped shirt. I've worn that combo a million times before. However in this instance, I felt it was necessary to give credit to Lauren for the inspiration! I like it… I always wonder what a fur vest would look like on me. Beautiful! I love the look of the leopard tunic and how you kept this chic yet modern. You know, I've been really struggling to restyle my fur vest - nothing not black seemed to look right with it. But leopard print - this could be what I've been looking for! I think it's fair to give props to another fashionista for inspiration when they've put together a look you never thought of and you recreate it after seeing their version. That's not all that likely to happen when it comes to pairing jeans and striped shirts, but in this case, credit was both well-deserved and due. In fact, I'm going to make my way to Lauren's blog now to get a little more inspiration. Yayy! Looks good! I love the print of that top! I love everything about this! Such a perfect look! I agree with your theory of when credit should be given. I also really, really need to get a faux fur vest. Yours is killing me. Leopard and fur is such a great mix on you. Enjoy! I'm in love with my fur vest but I never mixed with leopard and I really love it! I love that leopard top! Both of you girls look so chic with the leopard/fur combo! 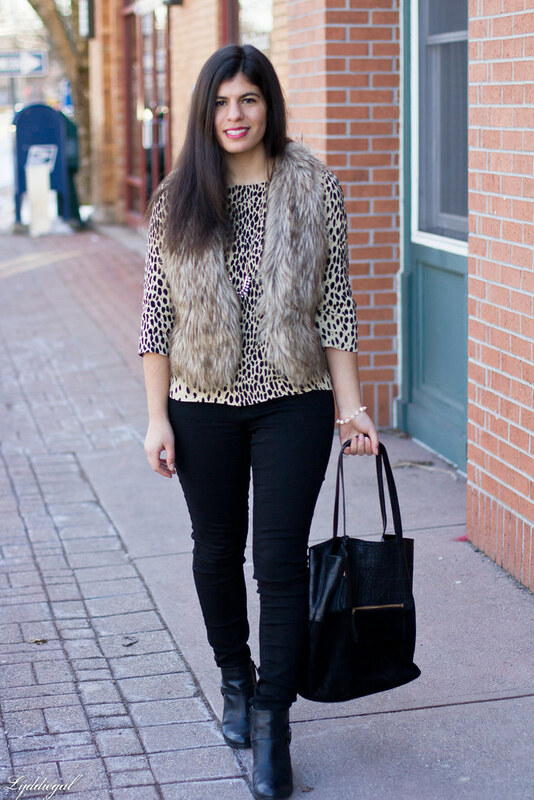 I am loving your leopard top with the fur! It's such a chic combination! This outfit is perfection, what a great combo! 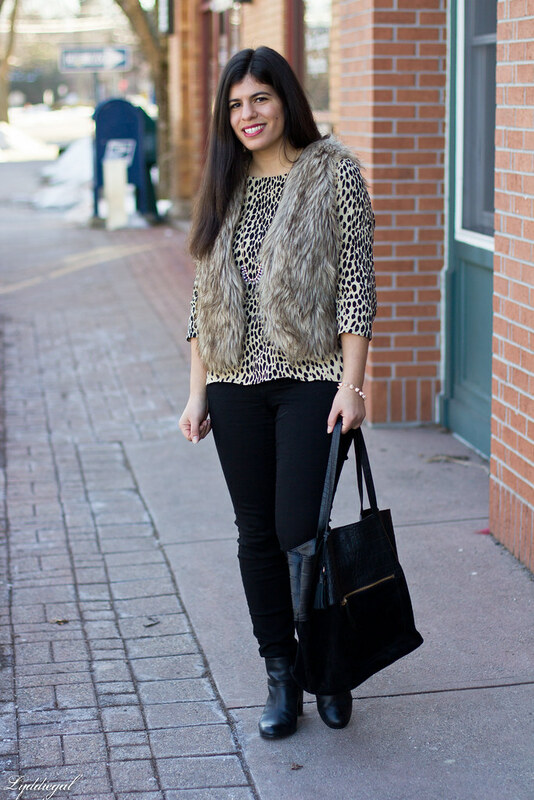 Love the leopard print with the fur vest! It's a great combination. I never know when to give credit for an outfit either. I tend to not worry about it unless it is an exact or almost exact copy. This is adorable! I really like the leopard/fur combo! Just love the leopard print of your vest! 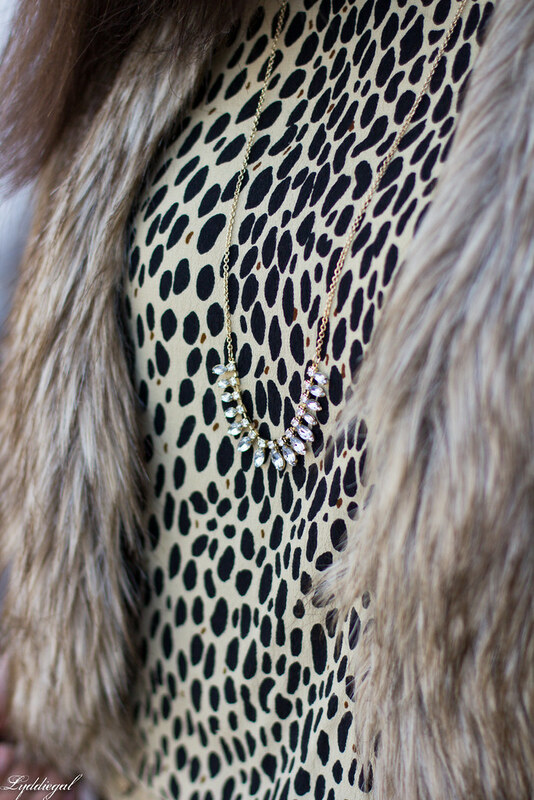 Ohhh leopard + fur is a fabulous combo! Love it! I love this--the vest looks perfect with that leopard top. I agree about giving credit. It's never a bad thing to do, but if I see an idea I like and then change it up to suit me (which is what I usually do) I won't necessarily give credit. However, when I straight up copy an outfit (also do that sometimes!) I try to remember to give credit to the original wearer! I did not use my fur vest this past winter. 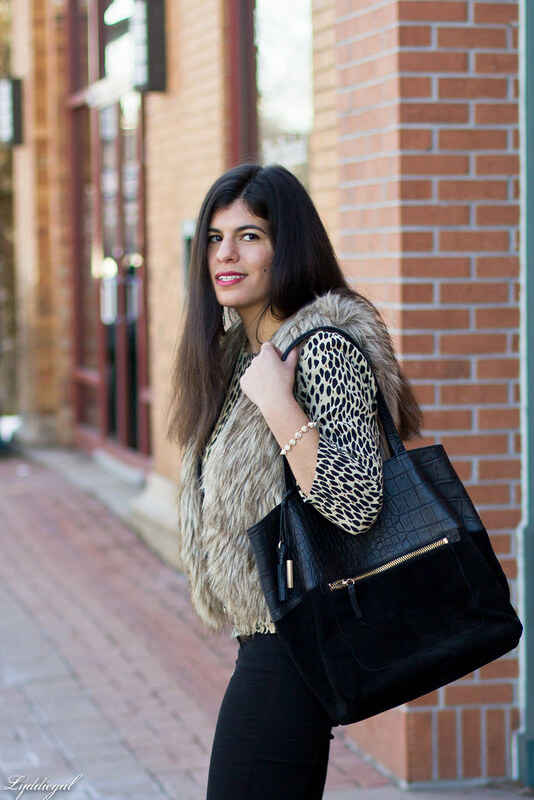 I love this combination of faux fur & leopard! Classy and on trend. Love the top and necklace and it looks like it is getting warmer there. Happy 1st day of Spring, Lydia! So in love with this look! 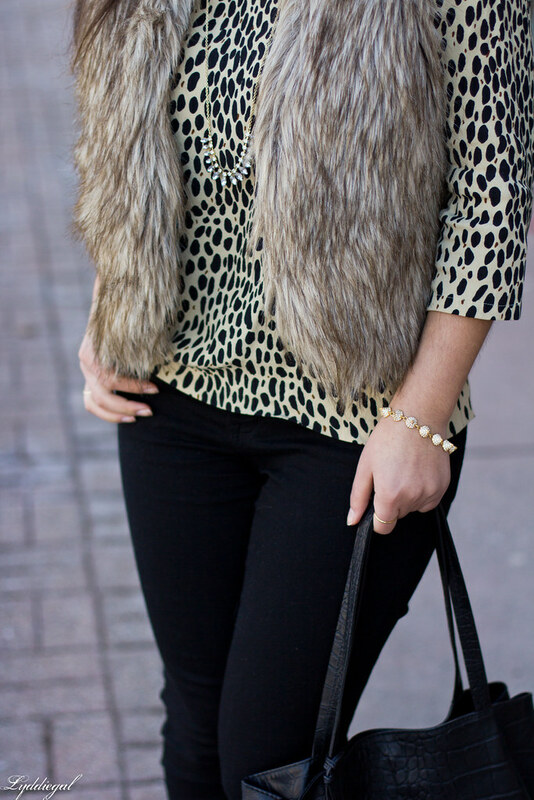 The fur paired with the leopard top is way too cute! I hope you have a great weekend! Obsessed with this leopard top. Beautiful fur vest! Really takes this look up another notch!